Discussion in 'Android Tablet Discussions' started by gurgle, Oct 15, 2010. This Flow Chart describes in simplistic terms whether you can update your Tablet to a newer Firmware or Android version. 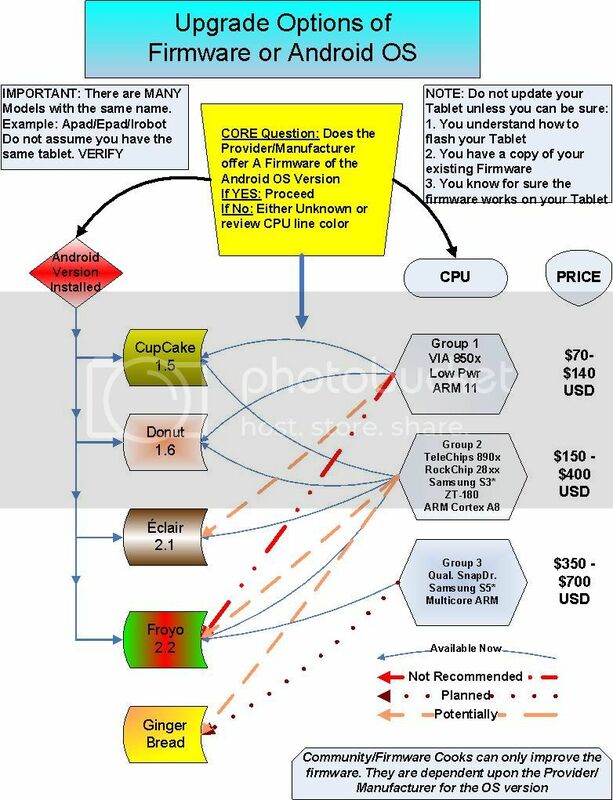 This Flow looks at two primary variables; Your Tablet CPU and your Vendor/Manufacturer. I hope you can use this detail to help make important decisions about selecting a new tablet, or upgrading your current tablet. If you see an error, Let me know. I will change and correct. I plan to keep this updated as time continues. Hoping telechips that ship with 2.2 will update to Ginger! But be aware that Android OS 2.1 can be used on the VIA Group division Wonder Media Technology: WM8505/WMT8505 300MHz (OC 350MHz, 375MHz, 387MHz, 400MHz) VIA VT8505 400MHz (OC 450MHz, 500MHz, 533MHz). Rooted Community working Android OS 2.1 since there was a Smartphone leaked using WM8505 chip on Android OS 2.1. So this might give those with these chips some hope, but who knows to early to tell? Thanks for that. I nearly put down the Orange Potentially line, but was unsure of how developed the User community 2.1 build was going. It is important all new users not just flash the ROM without preparation and research. There are many, many threads out there where the owner may have Br1cked their unit because they did not prepare and verify there is a ROM update which is compatible. Sometimes it is easier to retro-Flash a compatible ROM than find a new one. JUST because you have gotten a new tablet or Slate, does NOT mean there is a newer ROM or Android OS for your Tablet. Ppl like Tipstr do the research and verify. I am a Maker and look more to hardware hack. Some of the units inside I have seen are not pretty, (Jump circuits and such) Some are amazing. 1. DO NOT PLAN to Immediately flash. 3. Find or do a ROM dump before you start so that you can restore. ROMS are NOT Hard Drives. There are parallels, but You screw up, you may have a Brick. This is a well known fact for those of us who have been trying to rework the ARCHOS ROMs for past few years. I'm really bad with colors. For potentials, we can use dashed linetype on gray to make it less heavy. The best implementations for the OS should be in heavy (thick). Tegra 2 needs to make its way on this. Tablets are out more or less right about now.